As a meeting planner, you’re charged with organizing and managing many aspects of a program. Quite often, one of the items you’ll have to arrange is transportation. You’ll have to decide which vehicles are most suitable for your program, your guests and your budget. Not only will you have to ensure passenger safety and comfort but you’ll want to make certain you partner with a transportation company that can meet your demands should you have last minute changes or requests. 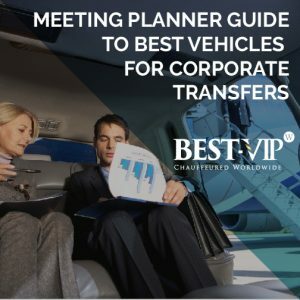 In the following meeting planner guide to best vehicles for corporate transfers, we break down the top priorities and the type of vehicles to consider when booking ground transportation. Thanksgiving is a holiday that makes you appreciate what you have to be thankful for while enjoying a wonderful meal with family and friends! Unfortunately, traveling for Thanksgiving can be a stressful process. It is estimated that more than 46 million Americans will travel more than 50 miles during the holiday weekend, with 12 million opting to fly to their destination. Choose your travel dates wisely: Some travelers believe the day before Thanksgiving is the busiest travel day, but many people are starting to travel 2-3 days in advance to try and avoid the crowds. Travel light: Unless it is a necessity, try to travel light especially if flying. This way, you avoid the long lines of trying to check a bag and the possibility of losing your luggage. Prepare yourself for airport travel: There are many ways to help avoid stress at the airport. First, check in 24 hours before your flight, since you can avoid lines by doing this with certain airlines. The day of, make sure to arrive to the airport earlier than you normally would, since security lines will be so long. Get ready for the road: Traffic on the road the day of Thanksgiving is going to be heavier than normal. Make sure to plan ahead of time and give yourself at least an extra hour in anticipation of multiple slowdowns. Manage your expectations: Travel can be crazy and many unexpected things can come up. Make sure you pack snacks and water so you won’t go hungry or thirsty! But overall, make sure you budget your time, keep your stress level to a minimum, and enjoy your time with your loved ones! No matter where you are traveling this year, BEST-VIP can help make your day easier. With airport transportation or car service to your destination, we help make the travel day easy and fun!